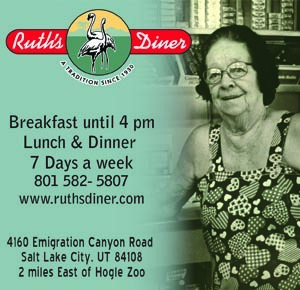 Fresh ingredients and conscientious preparation make eating healthy in Salt Lake City easy. Blue Lemon combines a café atmosphere with an upscale dining experience. I ordered Artichoke and Tomato Chicken, which comes on a bed of sautéed spinach and roasted potatoes. 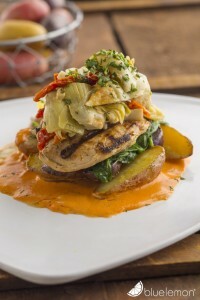 The all-natural chicken breast is iron-seared, and topped with fire-roasted artichoke hearts and tomatoes. The dish is completed with a sweet red pepper cream sauce. Every bite of this meal was amazing. The potatoes were moist, the artichokes and tomatoes were perfectly roasted, and the chicken was juicy and full of flavor. The pepper cream sauce added the perfect amount of zest to this wholesome meal. The Philly Cheeze Steak at Sage’s is a huge sandwich served on soft French bread, with a side of pomme frites and house-made ketchup. The meat alternative, seitan, is wheat gluten, and proved what our waiter, Dana, said to be true, “It tastes like really good chicken.” The sandwich came out steaming hot and oozing cheese (which was actually a rice mozzarella). The tomatoes and peppers were perfectly sautéed, holding onto their fresh flavor while perfectly complementing the rich overall taste of the sandwich. Even the most resolute meat-lovers would find this meal to be satisfying and delicious. Count on a Lebanese restaurant located in the heart of 9th and 9th to get vegan right. 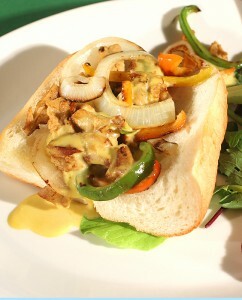 Mazza offers a wide variety of vegetarian and vegan dishes. One of my all-time favorites is the baked eggplant served over rice. 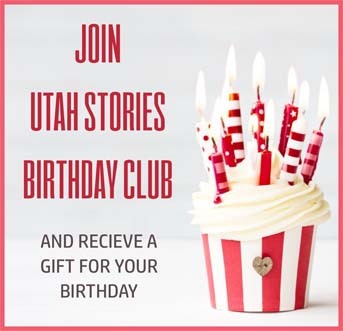 But, a more recent discovery is called Muhammara. There is nothing similar to compare it to. It is not hummus, it is not salsa. It is unlike anything we know of in the western world as “dip.” Muhammara is made with walnuts, pomegranate caramelized onions, and roasted bell peppers. It’s served with lettuce leaves used to dip or create a wrap. It’s delicious and is full of antioxidants. 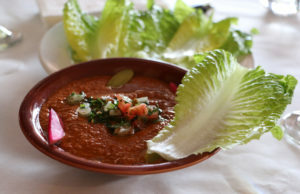 It offers a nice boost and it wins our award for best healthy appetizer in Salt Lake City. Zao Asian Café blends fast food with fresh Asian cuisine. The menu options are simple and well organized, and food is prepared assembly-line style, allowing customers to select everything they want in their meal. 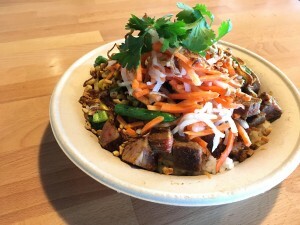 This is a rice bowl with seasoned steak, brown rice, wok-seared vegetables, carrot daikon, ginger scallions, crushed peanuts, and crisped shallots, all drizzled with hot house-made sweet soy sauce. The finished bowl was huge, and the ratios of the different foods were perfect (lots of steak!). Every bite was loaded with fresh Asian flavor, and it made for a healthy and fulfilling meal that didn’t take longer or cost more than any other fast food joint. 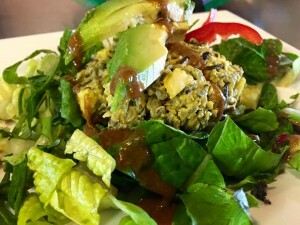 Omar’s Rawtopia offers a selection of organic meals, which helps preserve the enzymes, vitamins and minerals in raw food that can be destroyed by heat. There is the Coconut Curry Rich, which is one of Omar’s best-selling meals. It includes wild rice marinated in coconut curry sauce, then mixed with pistachios, raisins, broccoli, red bell pepper, onion, cabbage and celery, and topped with sliced avocado. For those who aren’t familiar with raw foods, this meal might be an acquired taste, but ultimately it was flavorful and light and will leave you feeling full, satisfied and probably with more energy than you had before you started eating it. 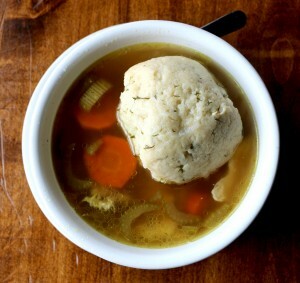 The matzo ball soup at Feldman’s Deli is made fresh daily. The big hunk of matzo is an egg and unleavened bread mixture. Feldman’s stock is made from real chicken. It has been proven that chicken stock is very healthy and boosts the immune system especially if the broth is made from bone. Bone broth contains calcium, magnesium, phosphorus, and other trace minerals Chicken broth also has a lot of gelatin which helps with joint health and provides glycerin, an amino acid that promotes healthy cartilage. I ate my soup with Feldman’s bagels and lox. The bagels are homemade and delicious and I opted for the wild Sockeye salmon, rich in Omega six fatty acids, the best source of brain energy. After lunch I was very full and I can report that I felt great all day.